This year I'm joining Vicky Charles with her goal setting for greatness 2016 linky. 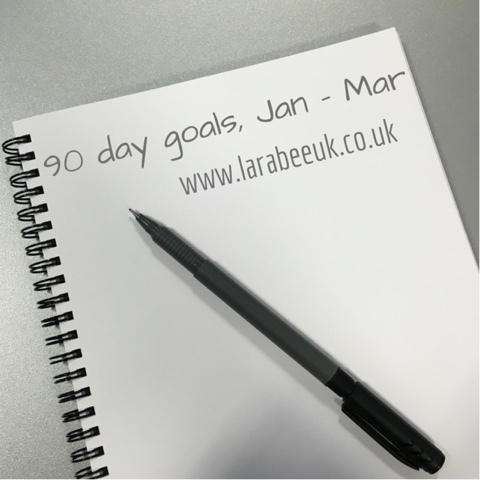 This year Vicky is focusing on 90 day goals at a time. As I come from a Finance background this resonates far better with me as I'm far more used to working in 'quarters'. I'm hoping that for this reason, I will be successful at keeping this years resolutions and goals. I'm recording 3 goals each for Personal, Blog, Home, Family and Work, making 15 goals, some are going to be difficult to measure so I need to work more on those, but as always I'm hoping that will evolve along the way. So far I'm feeling really positive about the progress I've made, long may it continue! Progress to date: Need to make some goals on this one to have something to measure. Progress to date: Need a plan of action to hit this! Progress this week: House tidy, but need maintenance routines to keep it so! Progress to date: Need a plan of attack for this! Progress this week: Photo printed and walkie talkie box remembered! Progress to date: Starting in earnest this week.